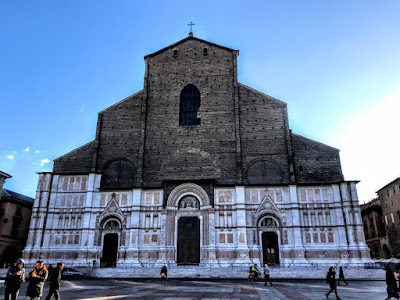 I am staying just two or three minutes’ walk from the Piazza Maggiore in the heart of Bologna, where the Basilica of San Petronio dominates the square and is the most imposing and most important church in this city. This is the tenth-largest church in the world and the largest church built of bricks. It is 132 metres long and 66 metres wide; inside, the vault reaches a height of 45 metres, outside the building is 51 metres high at its façade. 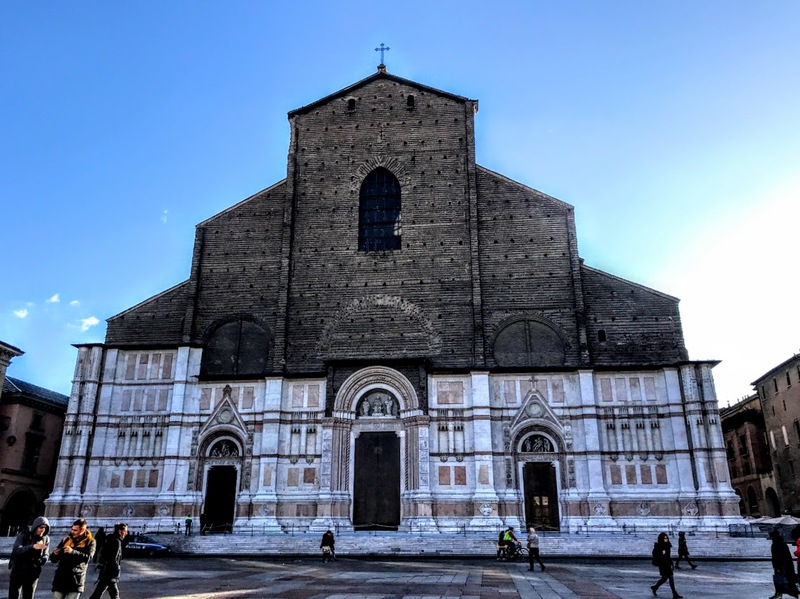 The church is named in honour of Bologna’s patron saint, San Petronio, who was the eighth Bishop of Bologna from 431 to 450. 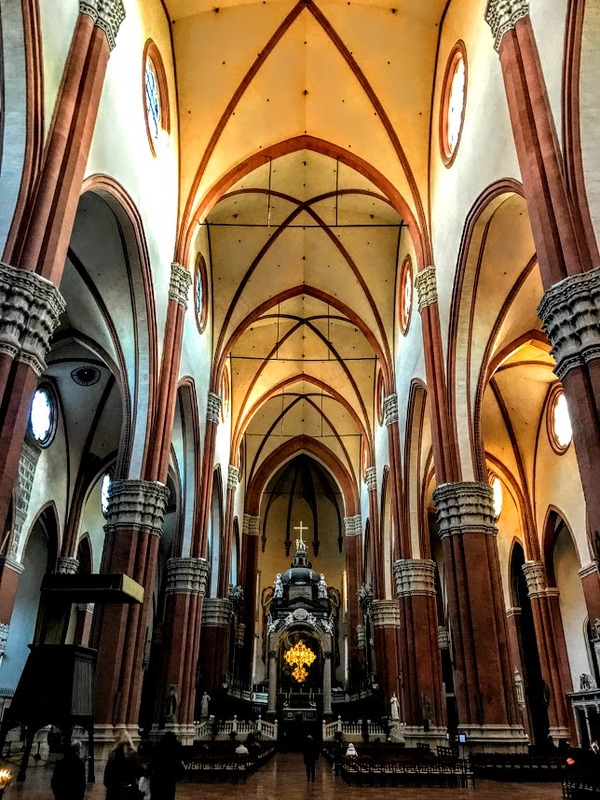 But Building the basilica was a communal project for the people of Bologna, and not of the bishops or the church, and it became a symbol of communal power in Bologna. Following a council decree issued in 1388, the town council commissioned Antonio di Vincenzo to build a Gothic cathedral, and the foundation stone was laid on 7 June 1390. From the beginning, the church was planned on monumental scale. To make way for the project, the Curia of Sancti Ambrosini was demolished, along with many other fine buildings, including at least eight churches and towers. When the architect died, his original drawings were lost and proved difficult to reconstruct his model, so that later plans changed his former proportions. Building work continued for several centuries. After the first version of the façade was completed, work began on the first pair of side chapels in 1393, yet this series of side chapels was not completed until 1479. Arduino degli Arriguzzi proposed a revised plan for the church in 1514. 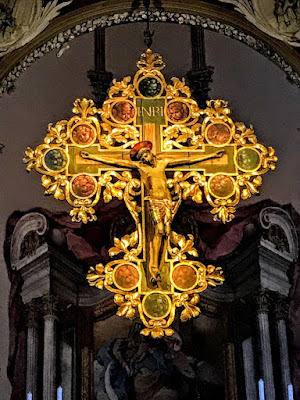 This envisaged a church in the form of a Latin cross and that would be larger even than Saint Peter’s Basilica in Rome. However, local tradition says, this ambitious project was quashed by Pope Pius IV. Ever since, the facing of the main façade remains unfinished. Although many architects were commissioned to finish the façade, none succeeded in the task. Inside, the basilica has 22 chapels, and the treasures include a Madonna with Saints by Lorenzo Costa the Younger, a Pietà by Amico Aspertini, the frescoed walls and stained-glass windows. In 1530. Pope Clement VII crowned the Emperor Charles V in the Chapel of San Abbondio. 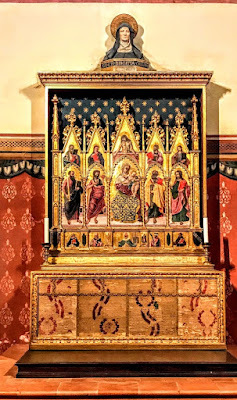 Later that century, Pope Clement VIII said Mass in one of the side chapels, and then went out barefooted into the square to bless the people of Bologna. The best-known and most splendid side chapel is the Chapel of the Magi, decorated with frescoes by Giovanni da Modena, showing the journey and return of the Magi, and the Last Judgment. This chapel once belonged to the Bolognini family. 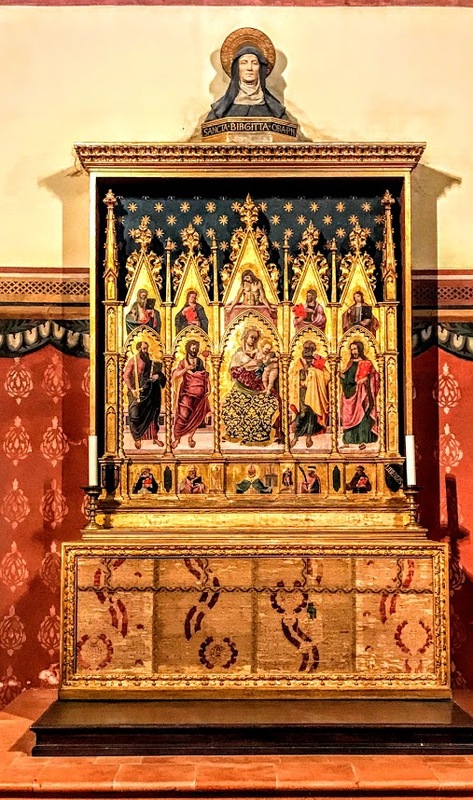 The triptych wooden altar with 27 figures was carved and painted by Jacopo di Paolo. 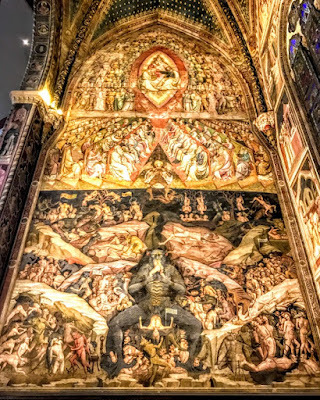 The walls were decorated by Giovanni di Pietro Falloppi and Giovanni da Modena with a cycle depicting Episodes in the life of San Petronio (north side), the Journey and Return of the Three Magi (east side), and the Last Judgment, the Coronation of the Virgin Mary and Heaven and Hell, inspired by Dante’s descriptions and with a gigantic figure of Lucifer. The vaulting and central nave were decorated by Girolamo Rainaldi, who completed this work in 1646-1658. Above the high altar, the crucifix hanging from the ciborium dates from the 15th century. In the right nave, in the niche under the organ, is the Deposition of Christ, by Vincenzo Onorfi, with seven terracotta figures. The church also has a marking in the form of a meridian line inlaid in the paving of the north aisle in 1655. It was calculated and designed by the astronomer Giovanni Domenico Cassini, who was teaching astronomy at the University of Bologna. A meridian line does not indicate the time, but instead the day of the year and meridian lines were also used to determine accurately the length of the solar year. At 66.8 metres, it is one of the largest astronomical instruments in the world. Its length corresponds to the 600000th part of the earth meridian. In 1775, it was restored by the astronomer Eustachio Manfredi, who substituted an iron line with a brass one. Later, Elisa Bonaparte, Napoleon Bonaparte’s sister, was buried here. The church was not transferred from the city to the Diocese of Bologna until 1929, and the basilica was finally consecrated in 1954. 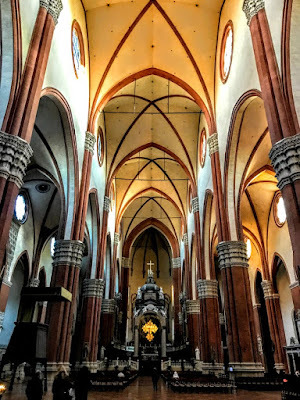 In 2000, the relics of San Petronio were moved to the church the Church of Santo Stefano, where they had been held for centuries.